Lisa Scott’s methodology is powerfully focused and driven. After deciding on a theme, she continues laboriously with that subject matter until she develops an easy fluency. 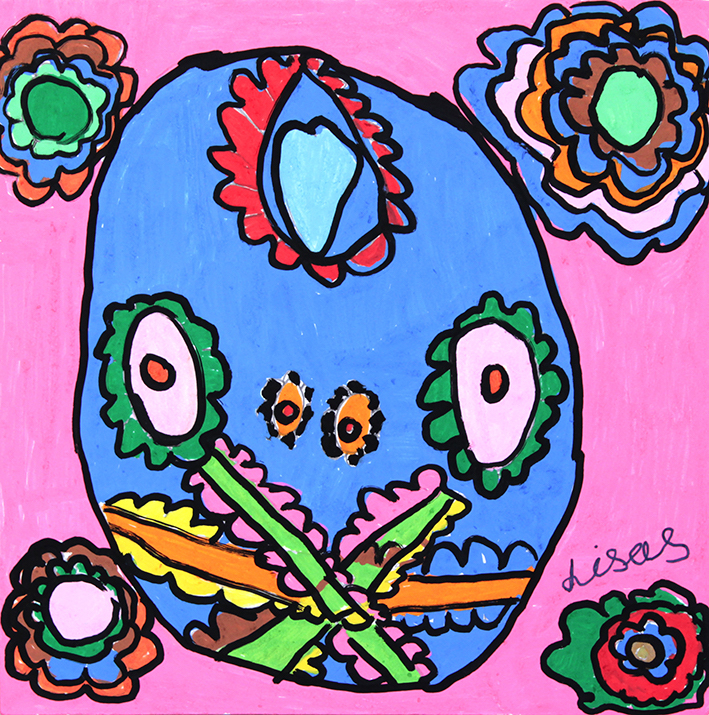 A recent source of inspiration for Lisa has been the Mexican celebration ‘Dia de Muertos’ (Day of the Dead). Her series of sugary skull paintings, which she describes as self-portraits, perfectly encompass the Mexican festival’s inherent contradiction. Lisa first began working with skulls in 2013, and has consistently returned to this subject matter. She works predominantly in painting but has experimented with a variety of mediums including screen-printing, quilting and installation. Her artworks compel the viewer with their fun, lively and lollipop sweetness, whilst simultaneously depicting scenes of death. Lisa has shown work at Sydney’s Underbelly Arts Festival on Cockatoo Island and Chippendale’s Beams Festival, both in 2015. In 2017 Lisa began development towards creating a biographical artwork that tells her personal history. This culminated to an exhibition in March 2019 with Lisa sharing an intimate showing of her very personal work. A delicate textile and text based dress inspired by the artists' lifetime of journal writing. “Lisa writes breathlessly, with little concern for the tug a war between now and then, past, present or future. In Lisa’s telling of it, life overlaps in messy and important ways. Something happy can immediately follow something sad. Hope can stand next to disappointment. Life can be dark and beautiful. This is something we can all understand. Lisa writes with great compassion and hope, she writes in order to, in her own words, make people understand what life is like for people living with a disability; how much harder they have to work and live and be understood.